Our Story, Unfolding Every Day! Look through any collection of wedding photos from the past half-decade and you are almost certain to find what is now an essential portrait: the wedding gown on a hanger. Over the years, this iconic trend has transcended the bridal suite closet to idyllic settings both indoors and out, resulting in shots that are just as beautiful as they are unique. But why take the time to pose and photograph a vacant wedding gown when the bride is going to have her photo taken in it all day anyway? The answer varies depending on which bride or photographer you ask -- and there are no wrong ones of course -- but the one I love the most is this: The unoccupied gown represents anticipation. Garden Grove’s 12 sprawling acres and 10,000 + square feet of luxurious interiors offer limitless ways to beautifully display and capture the perfect wedding gown portrait! Contact us to schedule your tour today. You may remember Andrea’s absolutely GORGEOUS bridal portraits, posted on the blog in November. Well, her wedding photos are here and they are equally lovely! Enjoy these beautiful photos taken by Vanessa Anne Photography! If you’ve visited Garden Grove Austin, you will have noticed by our five pint-sized greeters that we absolutely adore dogs. Shon and I understand that they are important members of the family for many people just like us — which is why we welcome our couples to include dogs in their weddings. It is such a joy to witness furry children hang out with mom or dad while they get ready and then accompany them down the aisle! Are you thinking about including a four-legged attendant in your big day? Here are a few things to consider first. Is your dog comfortable around a lot of people, or do they suddenly stop listening to you and get over excited or anxious? If you aren’t sure, it’s important to find out as far in advance as possible. If Fido isn’t a fan of crowds, but you have your heart set on including him in your wedding day, start working with an experienced trainer ASAP. A trainer can help get your pooch prepared in plenty of time, and ease both his and yours anxiety as he gets acclimated to being in busy environments. If a trainer isn’t in the budget, but time is especially on your side, there are lots of great resources online. Just make sure that when the big day does arrive you are 100% confident it will be stress free for both of you. If not, there are still other ways to include Fido in the wedding like naming a signature cocktail in his honor, or setting up a family photo display the venue. Either way, wedding planning can get hectic, so training sessions are also a great way to ensure you and your partner have some quality time set aside to spend with him! You may have already said “yes” to the dress, but what should Rex or Roxy wear?! Spend some time scrolling through #weddingdogs on Instagram and you’ll discover just how many ways there are to dress your four-legged best friend. Can’t decide between a tux, tutu, bow tie or floral collar? Whichever you choose, it’s important to remember that comfortable attire is just as important for them as it is for you. If opting for garb of the floral kind, make sure that it’s of the non-toxic variety. Also, be realistic when it comes to how long you expect Roxy to rock her tutu and/or flower collar. Brides will often change into more comfortable shoes after the ceremony and photos, and your furry maid of honor might also require a wardrobe change too. We’ve also had several dogs proudly join mom or dad down the aisle in their everyday wear -- nothing! If your pup is more comfortable in just her collar, then that’s perfectly fine too. Let’s face it, if your dog is in your wedding they are likely to steal the show no matter what they wear! There will be a lot of activity on your wedding day, and you’ll be pulled in a lot of directions. The last thing you want is to do is spend it worrying about where your dog is, who has him, whether or not he is behaving himself, and if he’s eating something he’s not supposed to. If you can trust your pup to stay dutifully by your side all evening without getting distracted by all of the hustle and bustle, great! (Believe it or not, we’ve witnessed this more than once!) If not, ask one of your human groomsmen or bridesmaids if they would consider this part of their duty. Make sure it’s someone who both you and your dog trust. It’s not a small request, so first ask yourself it’s a duty you would be comfortable taking on if the roles were reversed. If you can’t find someone in your wedding party or a trusted guest to take on the responsibility, there are actually pet sitters who will come to weddings! If it’s in the budget, this might even be the best option. A dedicated pet sitter’s attention won’t be split between taking care of Rufus, while also trying to enjoy the festivities. Their only focus will be on the happiness and safety of your pup, so you and your spouse can enjoy the night worry-free. Last but definitely not least, make sure your wedding venue not only welcomes your dog, but is also an ideal setting for them as well. Garden Grove Austin has over 10,000 square feet of interior spaces set on 12 gorgeous acres. (Not to mention our lower green, which is the perfect place to play a quick round of fetch to get the jitters out before the festivities!) Contact us to schedule your tour of the property today! All four-legged wedding attendants must be friendly and current on all vaccinations. This terrific couple’s wedding was the last of 2018, and it could not have been a sweeter event. Guests laughed, cried and then laughed some more. What an incredible day! The most fun wedding party portraits we’ve ever seen! It’s been a tremendous year at Garden Grove, and we are thrilled to be entering our third year as a wedding venue in Texas Hill Country (aka “The Wedding Capital of Texas”). 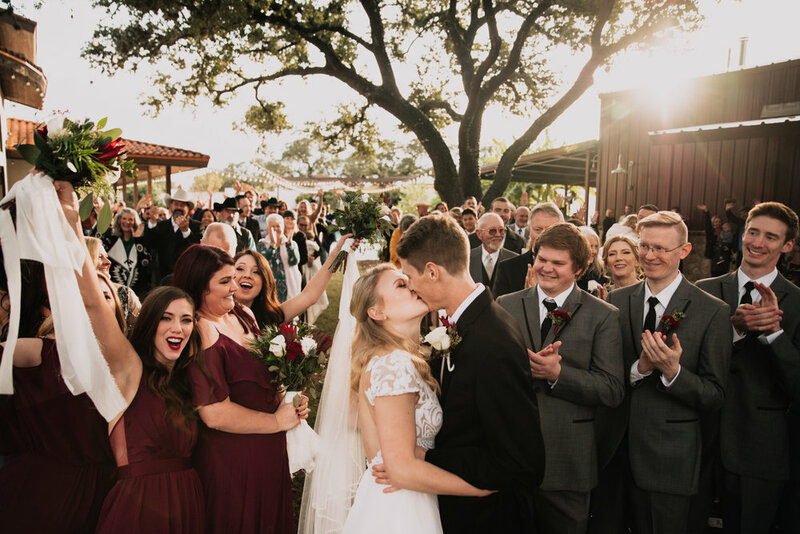 We are truly blessed to host couples from all over Austin, the United States and the world, as they commit their lives to one another in front of their loved ones. We cherish the relationships that we build with each and every one of them, and by the time their day arrives, cannot help but feel a little emotional ourselves as they exchange vows. My husband Shon and I consider ourselves especially fortunate to be in this business because Garden Grove was not originally intended to be a wedding venue at all. Sixteen years ago, I purchased these 12 acres -- nestled just outside of Austin -- site unseen. I was recently divorced, and wanted to make a fresh start. Everyone told me I was crazy for taking such a risk, but I’m so glad that did. It put me on the path for a second chance at true love: Shon. Fast forward several years, and we decided to build our forever home on this land. It took two years to design and two years to construct the 6,700 square foot villa, 3,400 airplane hangar-style bar, pool area and the landscaping that surrounds it. It’s worth noting that not only did Shon design much of the landscaping, he helped plant it with his own hands. Garden Grove was truly a labor of love in every sense of the term. One weekend while I was out gardening three years ago, a young couple pulled up the drive and politely asked if our property was available to rent out for their wedding. They’d visited multiple venues in the surrounding area, but nothing had felt quite right. Despite being located in “the Wedding Capital of Texas,” hiring our property out for weddings and events had never crossed our minds. The couple was so sweet, and after talking it over with Shon, we agreed to host their wedding on the property as a one-time thing. We had all of this land that wasn’t really being put to use by just the two of us, and both properties on either side of ours were empty or the house was far enough away to give us privacy ensuring no one would be bothered by the activities. . It was a spectacular event, and the rest is really history. “Garden Grove” the wedding and event venue was officially born in 2016. Since then, we’ve invested our time, resources and passion into making Garden Grove the best private wedding and event venue Texas Hill Country has to offer -- an option for couples that is not only luxurious, but also provides excellent value. Hoping to remove some of the stress of wrangling rentals from the equation for our couples, we purchased 400 mahogany colored fruit wood folding chairs, 30 round tables, and 8 banquet tables, use of which is included in the price of the venue. The massive 100+ year-old Heritage Oak Trees that surround the villa are beautifully wrapped with lights year round and more than 400 LED festoon lights adorn the pool area. Of course, we never considered charging a fee to turn them on -- something that we’ve heard some venues actually charge hundreds of dollars to do! We promptly had six custom cabanas built on the property so that Garden Grove could truly be a Texas Hill Country escape. Use of these is also inclusive in the fee. After working with the State Comptroller we learned we do not have to charge sales or hotel taxes. Regardless of whether the venue is booked for 8, 12, 24 or 48 hours, we never book more than one event per weekend. Your wedding should be as stress-free as possible, and we cannot imagine anything worse than having to watch the clock on one of the most important days of your life. This way, couples who live in town can also drop off things at the venue in the week leading up to the wedding. No rushing the morning of, and no asking vendors to pick up linens or other rentals at 2 am. The fees that we do charge for the use of these items is for set up and take down only. Couples are never pressured to use them, they are there purely for convenience. We’ve had couples use all, some and none of them and each wedding was equally lovely. Above all, Shon and I strive to provide a personal touch and attention to detail that we feel is impossible to put a price tag on. In addition to helping our brides and grooms find the right vendors, working with planners, making the property available for engagement photos or bridal portraits, we are present on the actual day (or weekend). We are there in the background should anything come up. For example, I’ll never forget Shon racing to pick up a few scattered leaves that had just fallen from the tree onto the aisle prior to an outdoor ceremony in the Fall last year, so that the photos of the bride’s walk down it would be perfect. Garden Grove is a wedding venue, but it is also our home, which also makes our clients our guests. As hosts we want our guests to have an incredible and unforgettable time. Booking only a limited number of events each year allows us to do this, and we are thankful to be able to do so. All of the couples and visitors to Garden Grove have heard this first-hand, but with the reflection that the New Year often brings, I couldn’t help but put it down in writing. So if you’ve made it this far, thank you for taking the time to read it! We are looking forward to a busy 2019, and witnessing more love stories unfold. If you’re planning a wedding in 2019 or beyond, we invite you to stop by take a tour and experience Garden Grove for yourself! The food is one of the most crucial ingredients of every wedding, but Austin food trucks are proof that it doesn’t have to be fancy or complicated to be totally fabulous! Garden Grove's circular drive makes a perfect spot for any Austin food truck! Booking weddings and events through 2020. Schedule your tour today! Having Andrea as a Garden Grove bride has been an absolute blessing. She has the sweetest heart and such quiet elegance. These bridals from Vanessa Anne Photography are breathtaking and perfectly capture Andrea’s beauty. We’ve been so inspired by all the beautiful fall flowers and design this season, and it has us reminiscing about a couple of our favorites from weddings of fall weddings past. We were so smitten with the understated elegance of Sarah and Jonathan’s wedding. Copper & Birch and Pink Parasol DC worked with a neutral pallet of white and green, paired with accents of steel blue. Leticia and Vu’s floral palette was full of rich colors and dynamic textures from Sweatpeas Floral. Flowing garlands provided an understated elegance to the head tables and gold votives and vessels for the guests. This was truly a breathtaking fall Texas wedding. We hosted an incredible cake display this weekend, and wanted to share some of the other spectacular cakes and sweets displays from past events. Here are just a few of our favorites. For their spring wedding, Alex and James chose a lovely two-tier cake from Catering With A Twist. The rich white buttercream frosting was topped with white, yellow and soft pink roses from Lee Warth. The couple also brought in a variety of fun doughnuts from VooDoo Doughnut, an Austin, Texas favorite, and the perfect compliment to their classic cake! The bride even had one specially made to celebrate her father’s birthday. There was nothing “traditional” about Virginia & Chris’ modern wedding. From her tropical decor to her jaw-dropping illusion wedding gown; Virginia put a truly unique twist on every detail. Her cake was no exception! From the hand painted effect on the front, to the sugar geode accents…. this masterpiece from 2 Tarts Bakery was truly amazing. Trisha and Matt’s marbled cake from Sweet Treats Bakery was elegant in every way. Floral accents by The Flower Girl perfectly balanced this modern look! This trio of cakes and cream puffs, from Simply Delicious Custom Cakes was a huge hit at our Summer Engagement Event in 2017, and we are still quite smitten. Not only were they absolutely delicious but they added a touch of whimsey to the event and provided guests with a variety of ways to satisfy a sweet tooth. Selena and Alex are tying the knot in Texas Hill Country! We are thrilled to be celebrating Selena and Alex at Garden Grove Austin, this weekend! They are our first fall wedding of 2018, and we could not be more excited for them. Take a moment to swoon over their engagement photos, while we finish prepping for their big day!